In general Bromeliads are a hardy shade loving plant that require little water to survive, in fact they seem to do well in a free draining soil and thrive even when neglected a little. However for most species a position which is protected from frost, as well as from the heat of the afternoon sun is essential. These conditions mimic natural growing conditions. So grown in containers, in the ground, in hanging baskets or as mounted specimens, Bromeliads, with a little care will reward you with wonderful foliage year round, and some spectacuar flowers. Bromeliads actually flower once and then die, however as they put out offsets, or pups and form clumps that regenerate, this death is not often noticed by gardeners with established clumps. The pups that are left with the mother plat will flower more quickly than those that are divided. The species with the thickest and stiffest foliage tend to be the ones that require the most sun. These include most Alcatarea and Dyckia which are well known as well as Hechtia, Ananas, Puya, Portea and Orthophytum. Of course exceptions are always present, with species such as Aechmea blanchettiana being a sun lover as well. Although widely grown indoors and in conatinaers, in warmer climates Bromeliads are an excellent understory plant. They grow well beneath evergreen trees, ferns, on patios and shaded decking areas as well as in more controlled positions such as shade houses and ferneries. In colder climates hothouses are also used. So a south to south east facing position works well, they will still need some light and sun, try for around 4 hours of sun a day, filtered light in the cooler parts of the day. In winter, especially in te cooler climates if you are growing indoors a south facing window is suitable. As light conditions vary greatly consult your local specialist or more exact conditions. If you live in a area that is subject to freezes and extreme cold you will need to over winter indoors or a greenhouse. In general two applications of fertilizer a year are adequate, on in spring the second at the begriming of autumn. A general purpose slow release fertilizer seems adequate for most broms. Liquid fertilizers are also appropriate, however with all used around 50% the recommended application as in general bromeliads are not overly hungry plants. A free draining well aerated soil is essential, a fine to medium Orchid mix works well in containers, however in the garden you may need to amend the soil to ensure good drainage. You can add course sand, wood chips and well rotted compost to outdoor plantings, however if the soil is waterlogged naturally then raising the garden bed can assist with drainage. As with many plants, bromeliads are best watered in the morning, this gives the plants a chance to dry out a little, especially the foliage before the heat of the day and the cold of the evenings. Most are best watered form above, especially the tank types. However watering once every 2 - 3 weeks is usually enough, and in winter even less. In the garden as in the natural environment they require almost no water at all except in very dry periods, so outside, limit watering. In containers it is a good idea to flush the pot with fresh water mid summer, this reduces salt build up from fertilizers. Although a humid environment is beneficial, for most types it is not essential. The Tillandsias and Vriesea's lend themselves more to mounting than other species. When re potting or 'potting up', try not to disturb the root system, and always ensure that the plant is repotted at the same level to avoid problems. Remove any dead or damaged foliage and add a little slow release fertilizer to the new medium. Dividing can be achieved by removing the offsets or 'pups' and potting them individually. 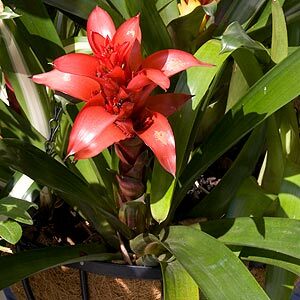 Larger clumps may need to be lifted, divided and repotted, usually into smaller pots as bromeliads seem to like a confined root system. Plants should separate easily with a good root system attached to each division, they need to replanted and watered in. If the root system is small avoid adding fertilizer.